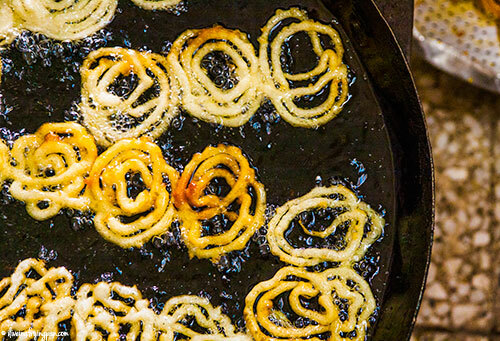 The crunchiest Jalebi you can find in Dubai. Your body is not happy, that's why you keep falling ill. You're not feeding it enough...Soul Food. Hm. Now there was a theory. It was not the lack of water, nor my negligence of multi-vitamins, nor my lack of sleep. Ali had a revolutionary theory about why my body implodes on me like clockwork every two weeks and it had nothing to do with mum’s bleak medical theories. It had everything to do with not enjoying enough comfort food. 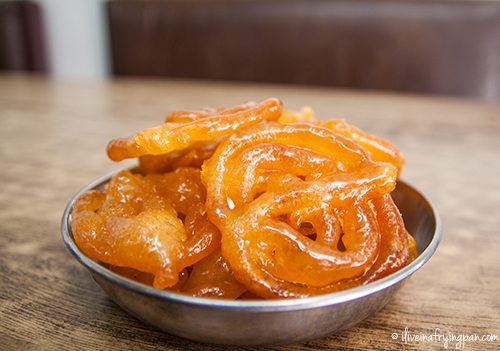 And as he pronounced those sage words, he shrugged his shoulders in the direction of the most obvious elixir of health that had hit our table that morning: crisp, syrupy jalebi. 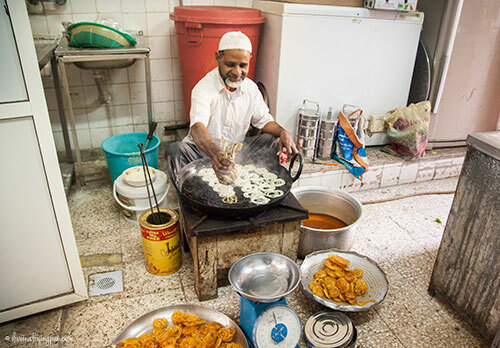 Friday morning had found Ali and I tracking down the famed fresh jalebi at Imdad caterers, a 27-year old kitchen patronized by the tight-knit Bohri community in one of Deira's oldest neighbourhoods: Naif. 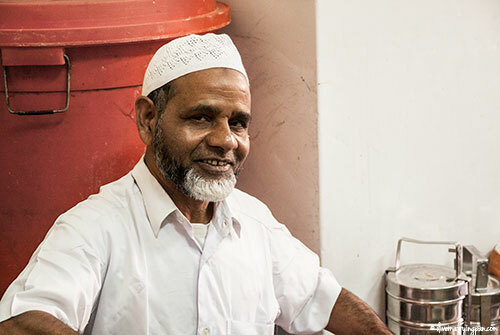 Imdadi has a reputation as a respected caterer with the Bohris, a reputation that is not easy to attain because nearly every Bohri child who has grown up with the flavours of community cooking in his mouth eventually develops a dangerously exacting palate. 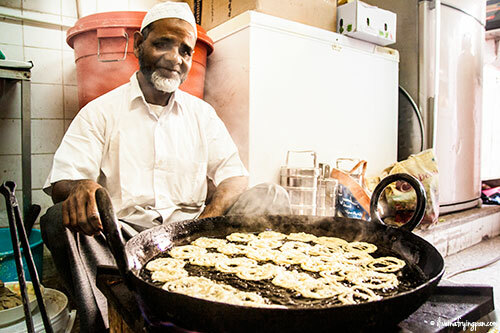 Imdadi’s fresh jalebi only makes an appearance on Friday morning. It's always the same chacha (uncle) at the seething hot kadai, the edges of his white skull cap trickling into dark side burns that end their journey at the snowy white goatie beneath his infectious smile. Once he hands over your candied loot, you had better eat them within an hour lest they degenerate into those gummy commercial excuses of jalebi that no self-respectable Bohri will entertain on her breakfast table. We were late. Most people had already tucked into an orange stack of sugary fritters, worshipping their stomachs before entering the mosque for Friday prayer. As Ali and I walked past the crumbling earthy red walls of the Bohri masjid towards Imdadi, I suddenly saw a six year-old girl anxiously glued to her mum and sister as the trio adjusted their scarves, slipped off their shoes, stacked them on the shoe shelf and then silently weaved their way up to the ladies hall in the mosque. That six year-old girl was me. And the memories of the burgundy walls fencing the masjid came surging back, making it the 80’s again with Chart Attack, Hyatt Regency and Al Ghurair – all the things that had made us feel hip…to be square. This masjid was admittedly not one of my favourite places in the city back in the day. It was chokingly crowded and my sister and I would find our bony bodies crushed between bulkier ladies staking out seating territory before the sermon commenced. Once, we stared in horror from behind a glass partition as a well-endowed lady heaved herself down and wriggled her back into a vast expanse against the glass, squashing an unsuspecting fly into a macabre streak of blood. As the lifeless fly smeared in nauseating zigzag lines across the glass, eventually plummeting to the ground as the lady peeled herself off of the partition, we hugged our limbs tightly into our flimsy frames and prayed fervently about topics completely unrelated to the sermon in progress. That Friday morning, a straggler or two drove up to Imdadi, parked illegally, rushed into the shop for “Chacha, ada kilo jalebi. Crunchy.” (Uncle, half kilo jalebi. Crunchy.) Chacha would do his bidding and minutes later, the straggler would bounce back out to his car, crisp jalebi in hand, and scarf down the syrupy fritters before the call to prayer. Tradition demands that you squirt some rich malai (cream) over the knotted tubes of sugary dough, the milky elegance of the cream atoning for the naughty candied crunch of the warm jalebi. Health freaks may cry foul, but two jalebi later, my weakened body was already feeling more loved. 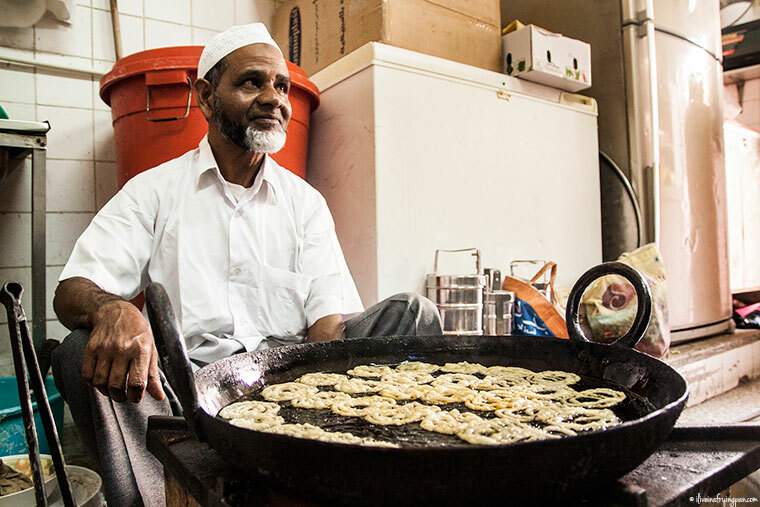 There’s something about the fermented dough at Imdadi’s that makes their jalebi special. 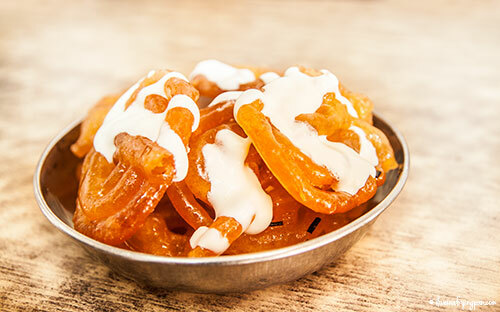 The batter fries up into jalebi with the fragile texture of hand-blown glass, the knotted candy tubes shattering into a satisfying crunch as you bite through the palm-sized loops. Imdadi’s sweet stack once reminded an aunt of the jalebi her father would bring home when she was growing up in Lucknow, many decades ago. They just don’t make them like this anymore, not even in India. And my aunt's reaction came after I had frantically rushed over to Sharjah to give her a taste, narrowly missing the one hour window for optimal jalebi freshness. Even an hour later, they were in far superior jalebi form than most other frittered beings I've encountered in Karama and Hor Al Anz. 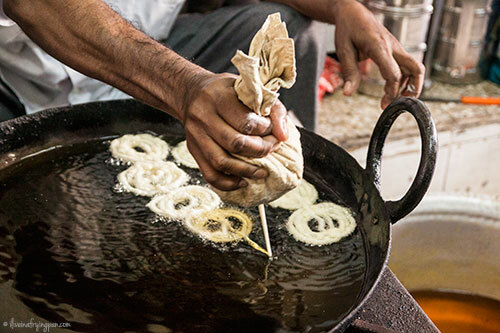 The secret might also have something to do with the thickness of the cheesecloth nozzle, or the temperature of the ghee – it would be blasphemous to fry these puritans of pleasure in mediocre oil – or the sugar bath in which the jalebi are submerged once they sizzle out of the oil. It could be anything really, but analysing the chacha as he crouched over the kadai on the ground, frying up the next batch of someone’s breakfast, I could not figure it out. It looked just like all the other jalebi set-ups I’ve seen in the past, yet the emerging candied webs were different. Subtly sweet, deceptively light, shockingly crunchy. Seriously, they just don’t make them like this anymore. My insides were smiling with the smug sort of inner happiness brought on by nothing short of four jalebi doused in cream. As Ali nudged the last jalebi towards me, I cried out in protest. Not one more! He looked relieved, the formality of offering me the last piece now out of the way. As he tugged the bowl back to polish off the last jalebi, the expression on his face affirmed his theory in practice. At that moment, he truly did look happy. I blinked with disbelief. A wood-fired stove?! Photography credits for this post: The sharp-shooter Sheban at Airspectiv Media. Hugs back! :) Thanks for the comment! Thank you for covering this place… although haven’t gone there for ages now (other newer places have made us lazy lately – Chattori Gali and others), we used to visit the place so often. Nothing seems to have changed – neither the jalebis nor the guy making it! Ah ha! Trust the sweet-toothed Bengali girl to know her jalebi haunts. When are you taking me for Bong-Chinese food? This was a treat to read Arva as it must be to sink your teeth into those crispy, sticky jalebi. I quite enjoyed the slice of your childhood that you shared as well. 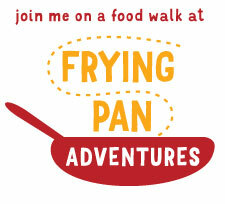 We’ve so missed you and are looking to catch up as we salivate along with your latest adventures. 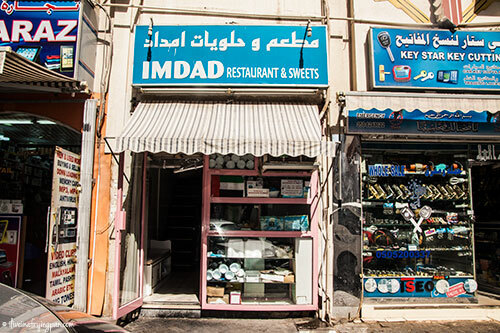 Like a typcial bohri food lover, my husband and I have been digging this place since the time I came to Dubai in 2011. Kebab pav and jalebis from Imdad is our staple Friday morning breakfast. The owners opened a branch under a name “Ezzi restaurant” in Qusais, very close to our home, but kebabs and jalebis don’t match the taste that is available in Deira. It’s incredible of you to cover such a small eatery. I am digging more of your articles right now! Please help! I’ve been walking around Naif Souk, Naif road for more than 1 hour but couldn’t find this place. I am leaving Dubai in 2 days and really want to try this. Can you give me more detail to find it. I coudn’t find “Saifee Masjid” on Maps either. Oh I used the Metro and got off at Baniyas Square Station and then wandered around but just couldn’t find it. Hi Alice, sorry this has been such a nightmare for you! :( Guessing you’ve already left but if not, here’s the google map pin in case it helps you find the place: http://bit.ly/1u71NER. Good luck! I love your blog!! Having been born & brought up in Dubai, I can so relate to some of the references you make in your posts like you mention here “Chart Attack, Hyatt Regency and Al Ghurair” – all the things that had made us feel hip…Lol, that brought back good memories!! Keep up the good work! cheers! Thanks Asha! Always happy to hear from someone who’s grown up here and to share memories :) Thanks for the kind words!